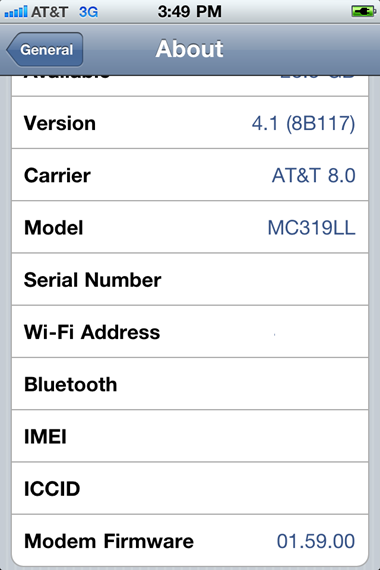 The final version of iOS 4.1 features a new baseband 2.10.4 which is currently not supported by Ultrasn0w 1.1-1. If you update your iPhone 4 to iOS 4.1, and then later downgrade back to iOS 4.0.x (with SHSH blobs), you still wont be able to unlock your phone as the downgrading of firmware wont downgrade your baseband, hence making it impossible to unlock. The following step by guide will enable you to upgrade iPhone 4 to iOS 4.1 without upgrading to 2.10.4 baseband. This method assures that your iPhone 4 on iOS 4.1 is on the older 1.59.00 baseband which will enable you to unlock your phone as soon as the new jailbreak tool for iOS 4.1 is released. Step 1: Download the latest TinyUmbrella (4.1.3) from here (Windows / Mac), and the original iOS 4.1 firmware for iPhone 4 from here. Step 2: Go through the readme file here. 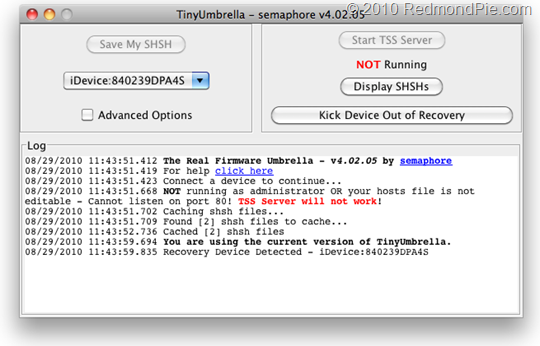 Step 3: Run TinyUmbrella and Start TSS Server. Step 4: Now run iTunes and restore (Not Update) your iPhone 4 to stock iOS 4.1. To do this, press and hold left “alt” (option) button on Mac (Left “Shift” button on Windows) on the keyboard and then click on “Restore” (Not “Update” or “Check for Update”) button in the iTunes and then release this button. Step 5: While restoring, iTunes at some point will throw 1004 error (baseband update failed). Step 6: Your iPhone at this point will be stuck in Recovery Mode, showing that “Connect to iTunes” screen. To exit your device from Recovery Mode. Click on “Kick Device Out of Recovery” button as shown in the screenshot below to restart your device normally. That’s about it! Once your iPhone 4 restarts, you will find it on iOS 4.1 with the older 1.59.00 baseband !